The plan would boost spending by the city, allocating more money for transit, transportation, police officers and firefighters. Seattle Mayor Jenny Durkan’s budget proposal for 2019 and 2020, unveiled Monday, would boost the city’s overall spending by about $300 million next year. The budget plan is the first put together by Durkan, who was elected last November, and it would increase allocations for transit and transportation by nearly $130 million in 2019. 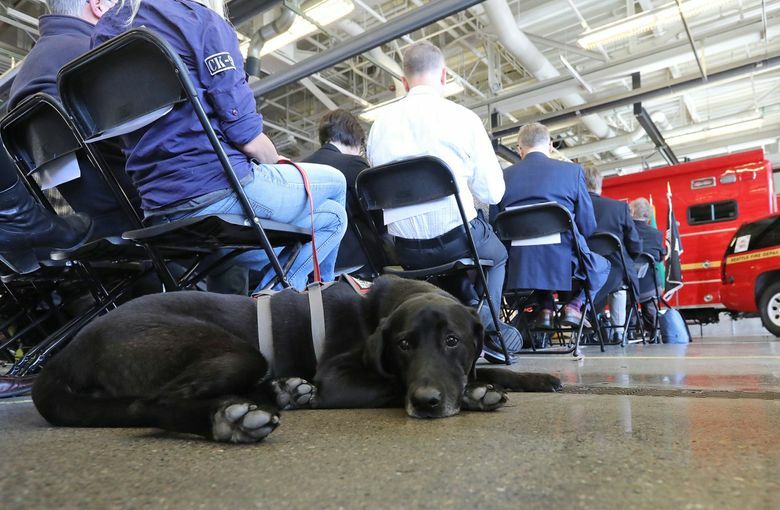 “This is a budget that invests in building a more vibrant city of the future — a city where, inside and outside of government, we keep innovating,” the mayor said, delivering a speech at a downtown fire station that is among the busiest in the country. Having promised voters she would scrub the city’s budget before asking them to approve new taxes, the mayor on Monday touted about $50 million in reductions to existing jobs and activities. 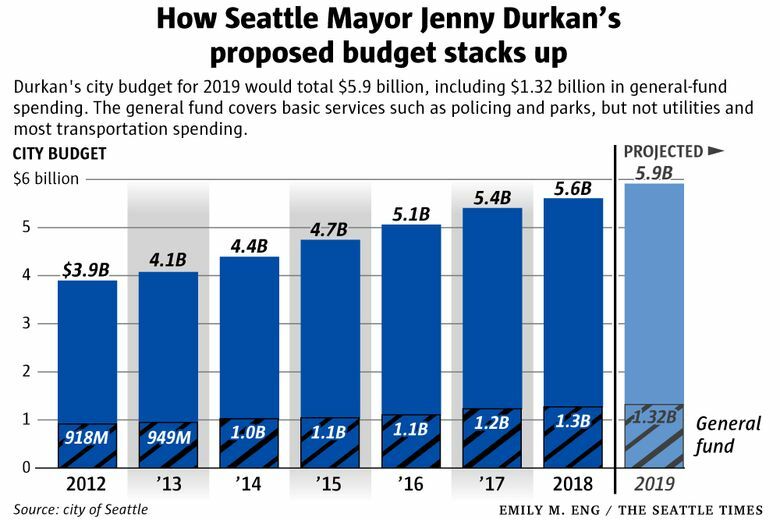 That money would be redirected to other programs and needs, with Durkan calling for an overall bump in spending — in line with the trend under her predecessor, Ed Murray. The City Council will review and modify the proposal between now and late November. The council will have a chance to gauge public confidence in City Hall before then, with a vote set for Nov. 6 on a $600 million-plus education levy. 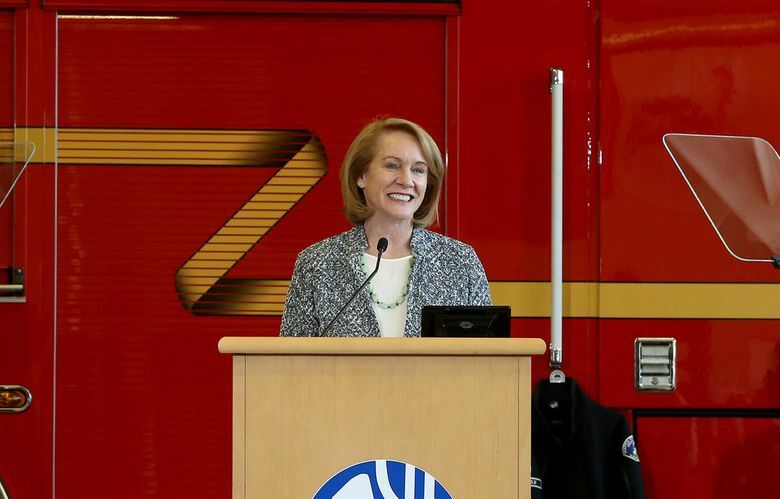 Durkan’s plan would set aside money over two years for 120 new firefighter recruits, 40 additional police officers and 24 additional workers in the customer call center for Seattle City Light and Seattle Public Utilities. For 2019, the mayor’s budget would total $5.9 billion, including $1.32 billion in general-fund spending. In comparison, this year’s budget is $5.6 billion, with $1.26 billion in general-fund spending. The general fund covers basic services in areas such as policing and parks but not utilities and most transportation spending. Seattle City Light and Seattle Public Utilities raise their own revenues. The plan would allocate $89.5 million in 2019 for housing and services meant to combat homelessness. That’s a bump over the $86.7 million being spent this year, and some homeless programs now paid for with one-time dollars would receive more stable funding. The jump in transit and transportation spending would be possible partly because the city has in recent years used less money than anticipated from its Move Seattle property-tax levy. Assuming the council approves an agreement with the union representing Seattle’s police officers, Durkan’s plan would include $65 million in retroactive pay and benefits for the officers, whose last contract expired several years ago. In March, the mayor said she was requesting that her departments seek trims of 2 to 5 percent, after accounting for built-in employee raises and inflation. Her budget proposal would reduce discretionary spending across departments on items such as travel and consultant contracts, and it would remove about 150 existing positions, many of which have been sitting vacant. Durkan’s plan also involves shedding 10 percent of Seattle’s government vehicles, partly to save money on fuel. An economic boom under Murray, combined with a series of voter-approved tax hikes, sent the city’s revenues soaring. But Seattle’s government spent even more, creating new offices for education, immigrant affairs and labor standards, and boosting the city’s spending on homeless services. Murray was the primary architect of this year’s budget but resigned last September amid sexual-abuse allegations, leaving interim Mayor Tim Burgess to unveil the proposal. Durkan would have had an estimated $47 million more to work with in 2019 had she and the council not repealed Seattle’s short-lived head tax on large businesses. They passed the tax in May and then reversed course in June after critical voters and businesses sought a referendum. The mayor and the council are urging Seattle voters in November to approve a property tax levy to pay for preschool, K-12 and community-college programs. The new levy would replace a pair of smaller, expiring preschool and K-12 levies. Outside the fire station where the mayor spoke, advocates for a supervised drug-consumption site in Seattle rallied for action. The city included $1.3 million for such a site in 2018, intending to partner with King County, but officials have yet to designate a location. Durkan’s budget would carry this year’s allocation into 2019. What’s in Seattle’s $130 million proposal to increase transportation funding?